Everyone welcome tomorrow night, bring a buddy male or female! We did well this week in splitting up the teams, may be too well as Wednesday we had 13 skaters and one goalie, Thursday was 10 skaters and two goalies! This week we have both Wed Nov 16th and Thursday Nov 17th, please check out Bench App and come play hockey! Christmas Party this year has been booked for Saturday December 17th, potluck at the Rossland Arena Lounge! 2017 Rossland Round Up. It's never too early to sign up! It must be time to send out the invitations for our Annual Rossland Roundup Tournament, because I am already getting requests about dates and spaces. The Rossland Roundup will be held on Feburary 17th, 18th and 19th, 2017. Due to an increase in ice rental costs, your entry fee this year will be $800, which includes 3 games, beer tickets after every game, dinner and party on Saturday night and all the fun you can have. As always, the hijincks will include 50-50 draws, door prizes from the amazing businesses in the Rossland/Trail area, and a raffle for signed NHL jerseys and high end hockey swag. We have had lots of inquires about our tournament, so to hold your spot, please get us a deposit cheque of $200 no later than December 15th, 2016. There are 4 spots available in each division - Men's Open, Men's Over 45, and Women's Open. Priority to returning teams until November 30th only. Please mail cheques to P.O Box 1973, Rossland B.C, V0G 1Y0 or e-transfer to janice.n at telus dot net. Don't forget to include your team name, and division preference. An e-mail with your intentions would be appreciated! We are so looking forward to seeing you all again! The Creston tournament was a lot of fun. Five women's team and the Smokettes made up half of the Nelson team as well, good work Smokettes. We won one, lost one and tied one! Back row (l to r): Danielle, Caitlin, Tracy, Ida, Sue, April, Kathleen, Jen and Heidi. Front row (l to r): ? ?, Mallory, Alison, Meghan, Holly, Divana, Sarah and Gabby. Due to our amazing enthusiasm for women's hockey and the great numbers on Thursday's we have added some Wednesday nights. The idea would be for the weeks where we have both Wednesday and Thursday, ever Smokette would attend either the Wednesday or the Thursday. Hopefully we are able to self regulate and generally even out the two nights. If this informal system does not work and we all end up on one night, we will have to reassess the situation. My estimate from BenchApp is that we should have between 15 and 18 people committed as some do not use BenchApp. If the number keep up and this works we will add more Wednesdays in the new year. No change to Saturday's as we have not had 38 skaters yet! The cougars would like to host us on their ice time, Nov 13 at 445 pm to 6 pm in Trail on the Big Ice. We have invited them to Rossland for the 10th of December at 730. Saturday in Rossland is now Bring A Buddy since a lot of the team will be in Creston and the Wildcats numbers are very low. If you are available, come play! A great turnout tonight Smokettes, I think we had 38 skaters and 2 goalies, I think this is a Smokette record! 1) Shelley Painter (250 five21-0326) ended up with someone's right handed, reebok stick w red grip tape at the top. 2) For the people that are not going to Creston on the weekend for the tournament we have invited the Wildcats to our ice, Saturday Nov 5th 7:30pm Rossland. We would like to confirm that we have enough players so please use bench app. If we do not have enough we may have to open it up to bring a buddy as well, please sign up! 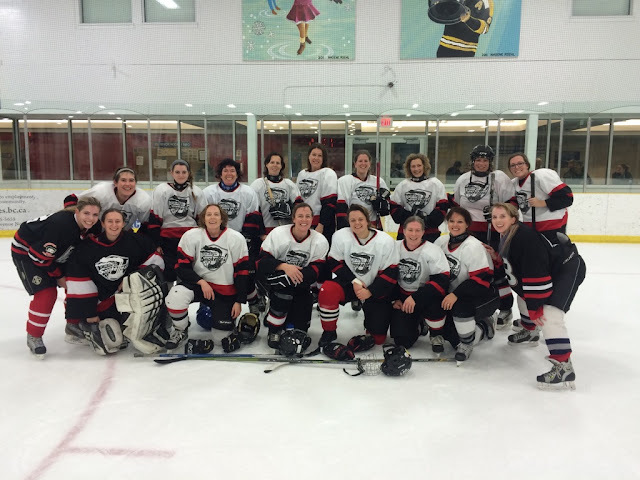 I'm looking for players for two different Women's Hockey Tournaments. Please let me know if you want to join us - Fun times! November 18, 19, 20 Wenatchee, WA == Spokane Women's Hockey needs 5 players for their upper level team. Hey, everyone! I need everyone to email me their TRP/sport pass number (if you didn't put it on your form) and mailing address ASAP. If you live outside of Trail/Rossland, you can get a sport pass number for free at the aquatic center but you do need to get one. This Wednesday at 7:45 pm we have hockey on the Hooches ice time in Rossland, we mixup with the men and it is always a lot of fun! October 29th and Nov 19th we will have Mark Heslop at our ice to do some skill development and flow drills. We are once again using Bench App this year. I see that 17 of us have already figured that out. Thank you to Heidi for updating the schedule. For the new players I have forwarded your information to Heidi and you will be added shortly, I believe that you will receive an e-mail from Bench App with your username and the option to change it and your password. Bench App is optional to use but it has been great for generally seeing how many people are going to be at hockey. See you all on Thursday, might be a packed ice but we can get on and off that bench fast! On the weekend of October 15th, Spokane is hosting a “Bust the Rust” tournament and WE’RE TOTALLY INVITED. Let’s lace up our skates and make the trip down south for a good ol’ fashioned face-off (get it, face-off!?) against the states (and other teams, of course)! Please email Gabby at gabrielle.herle at gmail.comif you are interested so we can get the numbers in. Gabby is in, and so is Mal, let’s fill up the rest of the bench! The schedule on smokettes.com has been updated. I will bring a bunch of paper copies to the first ice time next Thursday October 6th at 7:15pm in Trail on the kids rink. I will also be sending out a PDF for people to print themselves. Thank you to all that paid during the BBQ and if you have not please remember to bring your money to the first ice that you come to as we all need to be covered by our insurance. Cheques made out to Trail Smokettes. See you in less than 7 days. All the ice times have been added to the calendar, we are just in the final checking stages to make sure it was all added correctly and then an e-mail will be sent out with an updated and printable schedule. I will also bring some paper copies to our first ice time October 6th. Stay tuned, the 2016/1017 calendar is being updated on the web page. An e-mail will be sent to all once the schedule is complete. If you did not receive this e-mail then you are not on this years e-mail list, please e-mail trailsmokettes@gmail.com and I will add you to the list. If you are not playing and want to be removed from the list please reply and I will move you to the not playing list. The website calendar will be updated in the next week with the updated schedule, our days and times have not changed, still Thursday's evenings and Saturday morning or Saturday nights. Reminder that it is an outdoor rink (they have a zamboni!) ... and it is all about fun. 3 games, plus 1 on Sunday if you are one of the top two ladies teams. Not everyone plays Thursday night so arriving Friday can still work. Everything is in walking distance. We change in our room and walk across the parking lot. Change rooms are at the rink but we just put our skates on there. Pub is fun with live music on Fri and Sat nights. Cost of tourney and accommodation works out to about $225 to $250 based on 13 or 15 people >>> and if women don’t mind sharing a double bed, that cost can drop (guys can’t possibly sleep together!! ). There is a hotel, hostel (that’s where we stay) and condos surrounding the area. The polls are in! The Smokette sign-up party will be at 5:00pm on Friday, September 16 in Trail. If you need the address please e-mail trailsmokettes@gmail.com or ask a current Smokette. It is a potluck. Not sure if there`s a good way to organize this but I`ll get burgers if someone can bring buns. We`ll also need lettuce, tomato, etc. First to let me know can claim the easy stuff. Don`t forget to bring a chair and a drink, or two, or a few dozen. I have spare rooms if anyone wants to crash. Any other questions, just ask. On June 29th it will be three years since Carols tragic accident, to give back and say thanks to the community, she is organizing this amazing event and carrying on the tradition of helping out our own. The proceeds are going to be given to four nominated individuals or families in need and one charity or organization. Volunteers are desperately needed. We can't specify at the moment but if you could give us some time we will direct you on the day. The second Kootenay Carols Childrens Festival and Benefit Concert is on Wednesday, June 29th, from 2pm - 10pm, at the museum and discovery centre. We look forward to hearing from you. Ferraro's on Sunday - Sign the Petition! Erika Bailey and Tracy McCallum Have generously offered to be in Ferraro's in Rossland this Sunday to talk to people and ask them to sign a petition asking the Mayor and Council not to close the Rossland Arena. They will be there from approx 11am to 3pm. Please, if you get the chance, swing by and sign the petition. Please pass on this information to anyone else who wants to keep our arena open! I was at the budget meeting this is a very real situation and it came across extremely clear that if we want to keep our recreation opportunities ( In the case of the Smokettes the arena) we need to let the city know how important it is to us. The City also requested ideas on how to make running the arena more cost efficent. The curling club had all its members sign a petition. Perhaps having our year end party and having a form letter for each Smokette to sign and deliver to the council... Or a petition. But to be realistic we need every Minor hockey family and rec hockey family and figure skating club member and their extended families and friends and neighbours to let the city know we need to keep our arena open. Perhaps setting up a table at Fereros for a couple of days with a petition or form letter? Getting Minor Hockey parents, other rec teams and figure skating club involved. After years of dealing with trying to save our school I've learned the easier you make it for people to voice their option the better... People are busy!!! If all supporters have to do is sign their name to a letter or petition that's right in front of them while they are already out shopping and we take care of the rest I think we will get better results. Perhaps at the same time as their signing asking if they have any ideas on how to generate more revenue for the arena or make it more cost efficient and we can jot those ideas down? Or ......perhaps a community meeting with those that have time... even if it's one member from each user group to brain storm? We probably won t get a huge amount of people but we could still get small group of keen people that could come up with a diverse list of all kinds of great ideas? So we could hand in hopefully a thousand letters of support along with a hundred good ideas! I know you don't all live in Rossland, but a significant portion of our season is under attack by the current city council and mayor. Here is a link to a public presentation prepared by the interim CFO of Rossland, and presented on Wednesday night. While the presentation was slightly modified when presented, the overall tone was extremely "tough on recreation". As this is the 5 year plan, it is not too late to affect change by speaking out. The Mayor has publicly stated that recreation consumes 20%+ of our total budget, when in fact, recreation costs are 12% ($494,000 ) of our budget ( rec. budget - revenue = cost ). Rossland has some essential service infrastructure challenges to address over the next few years, and yet the current council and mayor are pushing through the non-essential Miner's Hall renovation project, which will cost $600,000, 15% of our total budget. The Miner's Hall costs $40,000 a year to operate, and has never generated more than $10,000 in revenue annually. The funds put aside over the last several years towards the Miner's Hall reno were insufficient, so council voted this spring to sell the Rotary Health building ( food bank building) to make up the shortfall. Rosslander's will pay an addition 3% increase in property taxes for 2016, with increases projected over the next 5 years of anywhere from 2%-10% annually. As well, council proposes cutting both recreation services and closing the arena, along with city provided services to reduce the tax increases. This will affect us and our families. There are significant savings to be found within the budget by deferring all or a portion of the Miner's Hall renovation, and revenues to be realized by selling the Rotary Health building and by implementing or increasing user fees for non-essential services. If we do not speak up and let council know our priorities, we will find ourselves paying higher taxes, having no access to ice times (Rossland Arena accommodated 738 hours of hockey last year), and possibly not having our street plowed in the winter so that we can have new siding and a new facade on the Miner's Hall. 38 of the 50- ish people on our mailing lists and rosters are Rossland residents, approximately 76% of our team. Trail will be in no hurry to accommodate our requests for ice if we lose our facility. I plan on attending the next council meeting, on the 25th of April, as well as meeting with the mayor and petitioning councilors to change the direction this council is moving in. I would appreciate any help my team can provide me. Meanwhile, make your voice heard, we have a very strong business case to save our services, and minimize tax increases, but we will have to work to get council on side. The Smokettes have an open invite tonight to the Cougars last ice time at 7:30 on the kids ice in Trail anyone and their spouses are welcome and they have two goalies. Max Ice is a no go but thanks for trying ladies!! Fyi..Creston is looking for a couple of players Mar 18-20th for Nelson Thorman Drillers . Interested let me know. Please see the workshop info below for “Level the Field Gender Equity Campaign” and pass along to those who have NCCP coaches or volunteers in sport that could benefit from this Free workshop on March 8th in Rossland! · Upon completion of the workshop, participants will have the opportunity to apply for a $1,000 grant to support a gender equity initiative in their region. · Credit: Certified NCCP coaches will receive professional development credits. We have opened up our ice times this Saturday in Trail at 3:30pm and next Saturday March 12th at 11:30 am to bring a buddy! It is on the big ice, come and play some hockey. I know the deadline has passed but Max Ice is looking for a ladies team as one just dropped out. We had 6 skaters show interest and really we could go with 10 and be fine If you ladies still interested please let me know ASAP. Deadline Friday, March 4th if interested. Castlegar – Unfortunately not enough interest as of deadline. We’ll try next year. However, Cougars are looking for skaters to possibly throw in a mixed team. If you are interested please let me know and I will get you a contact. A) Revelstoke – Women’s division is full. Unfortunately, we did not have enough interest so maybe next year. This looks like a good one to try. B) Nelson Thorman Drillers – Again, not enough interest at deadline so we’ll try next year. C) Grand Forks Black Betty’s Game & Party! Nelson – We had enough interest, but the Women’s Division is already full. We are on a wait list if any teams cancel. Again, we’ll try next year. So just trying to check off a piece of organizing for our tourney. We need people to sign up for bartending shifts that have a 'serving it right' certificate. And Sunday we have covered but if anyone can help this day from 10 - 4 that is great because we will be making Caesars and I'm sure it will be busy! Also looking for a few people to help transport alcohol to the arena when I pick up. This time is TBD. If you guys want to message me your availability that would be super! Thanks so much! Looking forward to the fun. I'll bring a hard copy to the ice times Thurs and Sat so you can also sign up in person! Below is the roster for our tournament, 2 games each as per usual arrangement. If you are unable to make your game please let myself or Tracey know asap. Payment collection will start Thursday night, Feb 11 at practice so please bring your $$$, $15 per game and payment must be received before you play. As well, now that the roster is out please contact Bridget regarding tournament jobs. Note..if you are looking for extra games the Betty's, Blueliners and the Cougars are looking for a few players. So take a look at the schedule and let me know (Christine) and we'll get you a contact. Positions will be available at game time. Janice 2 weeks until our tournament, the most fun you can ever have in an arena! We need your help to make it happen. 3. Sign up for your game times! E-mail Christine christinevenus721 at yahoo.ca or Tracy yotrace at hotmail.com with your preferences. 4. Sign up to help in the lounge. Many hands make light work, plus it's fun. E-mail Bridget bridgetkivell at gmail.com for the task schedule, or Leanne leanne.hall at rocketmail.com if you can help set up on Friday, or tear down on Saturday. 5. Nicole needs help picking up alcohol, mix and ice on Friday, and getting the bar set up. Nicole has worked really hard at getting this organized, lets make this part easy for her! Email niklangille at hotmail.com. Let's not forget to have fun! So excited to be spending a great weekend with you all. Most have emailed their game choices and we will do our best to get everyone their wish list :) For those that are still interested please let email me at christinevenus721 at yahoo dot ca and Tracey at yotrace at hotmail dot com as deadline is Tuesday Feb 9, 2016. 2) Revelstoke March 19 & 20th, 2016 - can we do this!! $900 plus hotel, 3 games with possibly 5 as high points from 6 team round Robin goes to playoffs. Right now games would be Saturday and Sunday. Email me at christinevenus721 at yahoo dot ca and Barb at barb_063 at hotmail dot com ASAP if interested as there is only 1 spot left. 3) Blueliners Tournament - April 1st-3rd, 2016 - $840, 3 games with 20 minute periods. Possible 5 games with playoffs. If you are interested please email me at christinevenus721 at yahoo dot ca and Barb at barb_063 at hotmail dot com as again, there is only one spot left. Tonight in Rossland is bring a buddy and due to a tournament our ice time has been bumped back 15 minutes to 7:45. Hope to see you all there. March 5th ice time has moved to 3:30 to 4:45 and we are playing the Revelstoke Kodiaks. We will all go out to diner after. Due to the activities during Winter Carnival our ice time on Saturday January 30th has been cancelled. The Rossland Winter Carnival is here! On Friday night I hope to see you out representing the Smokettes in the parade. We will be meeting in Rossland at the corner of Columbia and Butte at 6:00 pm. Make sure to bring a Smokette jersey and a stick. Well our 2016 Rossland Roundup Hockey Tournament is fast approaching, February 19th - 21st, 2016. Like every year each Smokette gets 2 games at $15 per game. Below are the game dates and times. Once you have decided on what works for you, could you please email BOTH Tracey Billet at yotrace at hotmail dot com and Christine Venus at christinevenus721 at yahoo dot ca on your choices. As well, when you email could you please rank your games by preference ie 1st 2nd and possible 3d choice. Deadline for submission will be February 9th (2 weeks) at which time we will finalize the roster and begin collecting payment. Again, you must pay before you play. Hi, Smokettes! Here is a sign up sheet for the tournament jobs. Lounge volunteers sit at the table and 1) sell raffle, 50/50 and beer tickets, 2) collect outstanding tournament fees and hand out team packages (this is usually/hopefully wrapped up Friday evening!) and take post game beer tickets to the teams in their dressing rooms. I know we don't know what games we are playing yet but have a look at the other times and let me know what you can do. We'll fill those blanks in later.